Aside from poor performance and high energy costs, many potential dangers can result from improper water heater installation. That’s why choosing the right plumbing contractor can make all the difference. If your water heater is broken or in need of maintenance, we can often schedule an appointment and have the problem fixed the very same day. 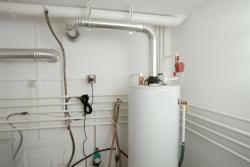 We know all about conventional gas and electric water heaters, as well as newer tankless water heaters. Don’t stress over water heater repairs, either. We will take plumbing problems off your back. You may purchase a water heater through us or pick up one from the supplier of your choice and hire us to install it. Remember, water heaters don’t last forever, but staying on top of maintenance and repairs can help extend the life of your valuable investment. To learn more about our water heater repair services or to schedule an appointment, contact us today.